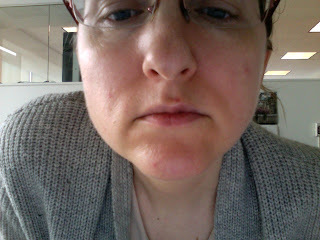 Updated photo of the post-stitch biopsy er, area? place? thingamajig? (Anyone else always thing of Fishamajigs every time they use that word?) If you're wondering, the other spots you can see (on each cheek and on my chin) are defects that aren't going to go away, one is a mole and 2 are...these other little red dot things I can't remember. Maybe broken capillaries, maybe rosacea and maybe those two things are exactly the same. Don't know. Before Hair. Aren't you glad you're not my stylist? 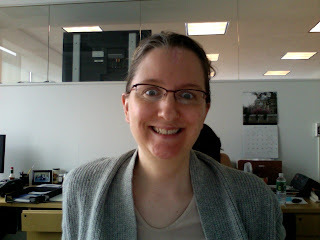 Which is why I'm wearing it like this (crazy eyes expression optional) when it's not under a hat. Are you having a good hair day today? Are you brave enough to show me? 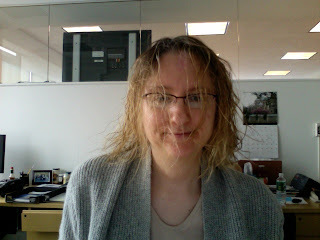 I am having a sucky hair day today. And, no, I'm not showing. When the weather warms up, my hair wilts. I cannot seem to find the right styling product for the summer months. The Oklahoma wind is whipping it around. I am having a brown day in black. Funeral days are never pleasant upbeat fabulous ones. I would send you a picture of my hair but my boss tested my patience today and I pulled it all out. Just got mine trimmed last night, it's about 1" long all over my head and I love it. I sported 3' long hair for years and years. On a trip overseas several years ago, the wild winds kept blowing my hair into my ice cream. I'd been pondering the big change of styles but the "hair in the ice cream" incident was what brought on the new do. The color is changing all on it's own, more gray now than brown. My cowlicks have a voice now!